When the Romans began taking over the Etruscan regions of Italy, the important town in this area was a fortified town on a hill - present-day Fiesole. The Romans established (or perhaps developed) a settlement on the banks of the Arno, and christened it Florentia. There are a few archaeological remains, but not many records of Roman Florence, which was a reasonably successful but not particularly important town. As the Empire crumbled, Florence's population declined to only one thousand by the sixth century. During the Middle Ages, Florence's star was in the ascendent. Ruled by great characters like Matilda, Countess of Tuscany, the town grew in size while its position on trade routes led to prosperity. Rich merchant families built themselves defensive towers and began the feuding that was to last for centuries. As the ambitious town grew, Florence was adopting a militant attitude to its Tuscan neighbours, with repeated wars against the likes of Fiesole, Pistoia and Siena. The argumentative character of the town was evidenced in its wars on local nobles and on rival towns, as well as rebellions and participation in wider conflicts, such as the vicious division of the city between the Guelph (pro-Emperor) and Ghibelline (pro-Pope) factions. Despite all the fighting, Florence was busily making money from banking, the cloth trade, wine and many other branches of commerce, with trades organised into guilds. There was also time for art: churches were built, Dante wrote his great poetry, Giotto was commissioned to design the Campanile. In the fifteenth century, Florence embarked upon the stage in her history which would bring her lasting glory. A banking family called Medici gradually rose to power in the town, becoming rulers in all but name. Various members of the family, but particularly its most famous member, Lorenzo de' Medici, used their wealth and importance to patronise artists. It was start of the era that was later to become known as the Renaissance, and among the artists employed or encouraged by Lorenzo and his family were Fra Angelico, Donatello, Filippo and Filippino Lippi, Botticelli, Leonardo and Michelangelo. Florence was full of great art, and its proud centrepiece was Brunelleschi's grand cathedral dome, finished in 1436. This period of luxury was soon followed by revolts, with the stern preacher Savonarola organising the Bonfire of the Vanities, when art, jewels and finery were destroyed in a fire in Piazza della Signoria. Before long, the preacher himself was burned in the same spot, and more unrest followed. Then, in one of Florence's many about-turns, the Medici family were welcomed back, assisted by the rise of one of their number to the papacy. The Medici were now Grand Dukes of Tuscany, and they proceeded to reign, with variable success, until the family died out in the 1700s. The title passed to the Austrian royal family, who presided over Florence in the days of the Grand Tour. The town was more peaceable now, and foreign visitors came here to admire the art and enjoy the indulgences of Florentine society. Tourism came to a halt when the town was taken by Napoleon Bonaparte's army, but revived upon the restoration of the Grand Dukes. The next major change came with the revolutions leading to Italian unification. In the 1860s Florence became the capital of Italy, and King Vittorio Emmanuele II took up residence in the city, which saw major developments of wide streets and building on a large scale to accommodate the new administration. Then, a few years later, the capital moved to Rome, and Florence was left to the locals and the tourists. Visitors included Queen Victoria, Henry James and Oscar Wilde. In the 1920s Fascism took hold in Italy, and in Florence huge crowds gathered to cheer Mussolini, who in 1938 entertained Hitler in Florence. During the Second World War much of Florence's art was evacuated from the city, although in the event the town was not much damaged by aerial bombing. As the Allies arrived to take the town from its German occupiers, though, the Germans blew up all the city's bridges - apart from the Ponte Vecchio. The bridges were rebuilt after the war, but it wasn't the end of Florence's troubles; a great flood in 1966 caused widespread damage to the city and its art, the waters rising to swirl around the Duomo. Yet again Florence and its treasures had to be restored. Once more, the tourists returned and showed no signs of losing interest in this museum-filled city. As the twentieth century turned into the twenty-first, Florence was one of the world's major holiday destinations, full of hotels, restaurants and shops catering for the steady influx of overseas tourists. 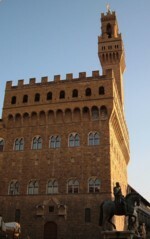 Florence's history is so eventful that it's hard for any single account to do it justice. However, Christopher Hibbert's book Florence: The Biography of a City is a good starting-point; a spirited and readable account of the entire history of this warmongering Tuscan town.